Many people are unknowingly familiar with the name Rubin Carter. For Bob Dylan fans, Rubin Carter’s imprisonment was the inspiration behind the song “Hurricane”. For film addicts and Denzel Washington fans, Carter’s was the story that inspired the 1999 feature film The Hurricane. Rubin ‘The Hurricane’ Carter’s story is a heart-breaking one; the product of a trying childhood in New Jersey Mr. Carter eventually became a professional boxer and was a legitimate contender for the middleweight title. Mr. Carter’s potential for greatness was tragically and abruptly cast aside in 1967 when he was found guilty for the murder of three people killed in a bar shooting. Written from prison, The Sixteenth Round chronicles Mr. Carter’s life; from his adverse upbringing, his triumphs in the ring, his furious battles with the legal system, and finally the grueling time he spent in prison. The Sixteenth Round was originally written by Mr. Carter to spread his story, attempt to set the record straight and hopefully get a new case hearing. However Mr. Carter’s story is an eternal one, a disdainful accusation about the racism and inadequacies plaguing our legal system that is rooted in the classic tale of ‘the little guy’ versus everyone else. 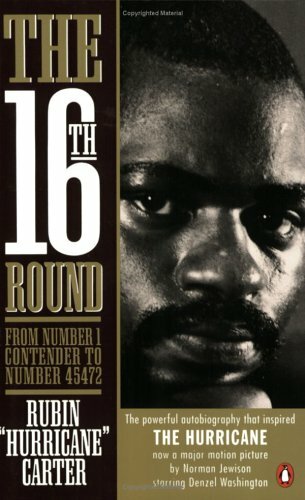 The Sixteenth Round is an eye-opening portrait of a man who against all odds rose to the top, only to fall even further than he could imagine. Lee Eigner attends the University of Missouri where he’s double majoring in Mass Media Communications and Film Studies.